…it's perhaps the most important work we have published ever. If you have not downloaded it yet…We urge you to do it right now. We believe it has the incredible potential to dramatically change your life…forever. As soon as you download it, We will also automatically block a FREE seat for you at the Rebirth of India MEGA SUMMIT. At the Summit, Senior Analyst and Co-head of Research, Tanushree Banerjee will reveal full details about Rebirth of India…including specific opportunities to profit from it. By the way, income tax rates have largely stayed put in the last couple of years. But why stop at direct taxes? Even on the indirect tax front, GST led to an increase in taxpayers by more than 50%. 3.4 million businesses have become part of the taxpayer base. So it's not surprising that India's tax-to GDP ratio has improved considerably. In FY18, it touched 18%. In FY19, it is expected to reach 18.5%. But that's not all, dear reader. India's per capita GDP is about to cross a vital threshold of US$ 2,000. As per the World Bank, a huge transformation takes place once a country reaches this threshold. She's travels hundreds of thousands of kilometres in search of new investment ideas for Equitymaster subscribers. This is one of the reasons Richa's recommendations from Hidden Treasure have generated double, triple and even four-digit gains in the long run. And her 'boots-on-the-ground' research has recently uncovered 4 lesser-known small companies you could consider investing in right now. Basically, countries become more competitive. Productivity and wages rise along with advancing development. India has now reached this sweet spot. The government can invest in infrastructure projects such as roads, affordable housing, ports, airports, etc. This will give a big boost to economic growth. It will provide good support to the government's GDP growth target of 8%+. It will help lower the burden on the government's fiscal deficit. Similarly, it would reduce the dependence on disinvestment. It would also help to strengthen the social security net in our country by giving the government more spending power in areas like education and health care. I believe, India is clearly on the right path. This will go a long way in creating a new India. But these are only 2 points. How can I be so sure of such a big transformation in our economy? Well, that's because I've uncovered not 2 points but 50! That's right, dear reader. Over the last few months, I've found 50 irreversible trends that are changing India for the better. Put together, these changes will result in what I'm calling - Rebirth of India. The Rebirth of India is at the heart of my big prediction: Sensex 100,000. I believe, this is a once in a lifetime opportunity to buy multibagger stocks. This great transformation in our economy will happen only once...and you must make the most of it. To help you take your first step, I've prepared a special report for you - Rebirth of India. I urge you to read this report and join me on Thursday 31 January for a free online summit where I'll tell you exactly how you can profit from the Rebirth of India. Register for the Rebirth of India summit here. PS: The Rebirth of India summit is only 8 days away! 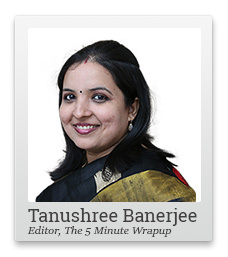 Join Tanushree as she shows you how to amass life-changing wealth from India's rise as an economic superpower. As a patriotic Indian, you should not miss this dear reader. Register now for the FREE online summit here. Equitymaster requests your view! Post a comment on "2 Reasons Why Rebirth of India Will Drive the Sensex to 100,000". Click here! 1 Responses to "2 Reasons Why Rebirth of India Will Drive the Sensex to 100,000"
Your analysis and prediction is contrary to what Equity Master team (including it's Editor) just after De-monetisation. You have criticized both actions forecasting a bleak economic outlook. How you have not acknowledged your changed perception to your readers?